Contrary to all expectations, the traditional Sant Jordi (aka Saint George) festivities all over Catalonia have been blessed by sun and fun despite being smack in the middle of Easter, and with rain forecasted for today that never appeared. Powerful indeed is our patron! 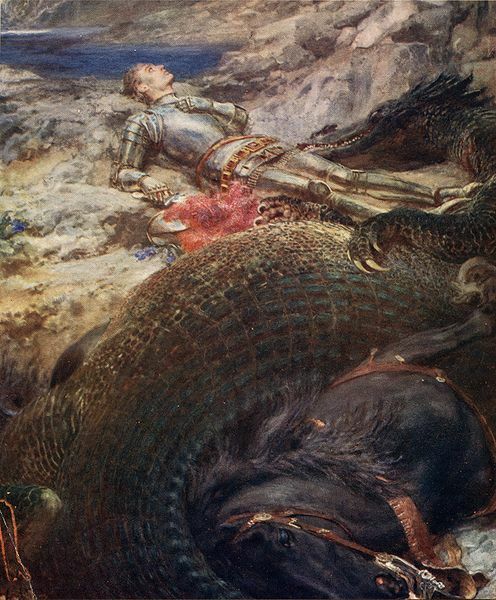 It has been a year since we discussed how the legendary dragon-slaying exploit of this popular saint has been downplayed by the church and even by classical art depictions of him impaling puny reptiles and armadillos. The church has no use for the dragon episode; what is relevant to them is that he refused to renounce his Christian faith and was tortured to death for his beliefs by order of Roman emperor Diocletian. The fact is that there is no real consensus on who exactly Sant Jordi really was, some historians believe he is a recycled pre-Christian mythical figure or a combination of different Georges of Roman times. The dragon episode was apparently added to his repertoire by early Crusaders who adapted Holy Land lore to the chivalry tradition… the historical Georgius was born in Lydda, Palestine, and indeed his supposed remains are enshrined in Al-Quds to this day. It stands to reason that Saint George was borrowed from pagan faiths; after all, slaying monsters has been standard hero fare since the days of Gilgamesh and Hercules, although with the advent of Christianity the focus shifted from heros killing beasts to martyrs being killed like beasts. Being victorious over the adversary was substituted to being submissive to God’s will. The legend of Saint George is a careful balance of the old with the new (he slayed the dragon and converted the local pagans), which further suggests its recycled nature. Let’s begin with some context regarding dragons. All major cultures and religions in the world share dragons or plumed serpents as part of their mythology; the Chinese even include it as a zodiac sign along with 11 real animals. The mythical dragons are highly evolved creatures, with great powers, intelligence and a fondness for hoarding gold and treasures. Some schools of thought connect it to an even more mythical race of reptiloid beings that came from a far system searching for monatomic gold. 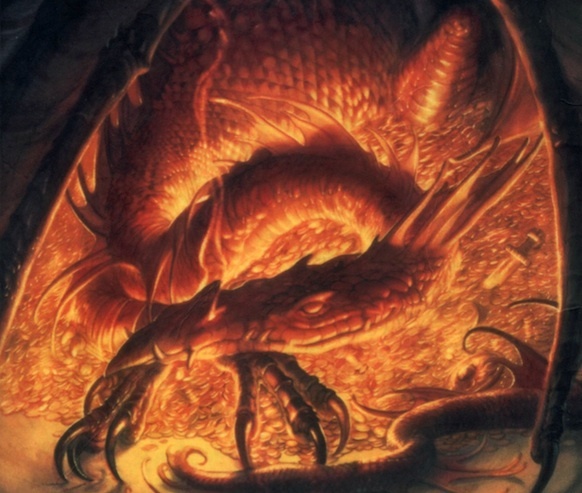 Regardless of their origins, dragons are real in the human narrative –call it Saint George, Quetzalcoatl, Dragonball or The Hobbit– some wise, some rogue and all imposing. On a time he came in to the province of Libya, to a city which is said Silene. And by this city was a stagne or a pond like a sea, wherein was a dragon which envenomed all the country. And on a time the people were assembled for to slay him, and when they saw him they fled. And when he came nigh the city he venomed the people with his breath, and therefore the people of the city gave to him every day two sheep for to feed him, because he should do no harm to the people, and when the sheep failed there was taken a man and a sheep. Here we have an example of a dragon that was following the old dominance dynamic in its most primitive form, as eater and herd, like many other mythical monsters all over the world slain by the heroes of yore while establishing the dominance of the human race over previous paradigms. And this was no mere iguana-impaling session as some Renaissance artists would have us believe, but a fight to the death between two powerful entities in which one emerged victorious but not unscathed. Because the battle was won, but where the dragon had once imposed its rule, other forces were already moving in to fill the gap with a new set of rules: from then on, only humans were allowed to prey on humans. The church likes to point out that dragons are mythological creatures, and so it is unlikely that good ol’ Georgius the composite Saint ever REALLY battled dragons any more than Saint Patrick battled leprechauns. But they insist the other stories about saints and miracles are all true to the letter. One way or another, their take-home lesson is that some dude or dudes, possibly named George, probably didn’t kill a creature that never existed. And yet here we are, 15 hundred years later, still talking about the dragon slayer, celebrating his exploit and praying for his patronage. What part of us continues to resonate so strongly with his narrative? Perhaps deep down we feel that beyond our conditioned reality there are places liked the ones marked in the old maps: here be dragons. Walk with us, Georgius. Bonus music video! The prayer to Saint George, put to music and performed by the great Jorge Ben. Tale as old as Proto-Indo-European time, at least….